The EDGE Self-Access Center is a free space where you can enjoy chatting in English with international students and get help with your speaking, listening, reading and writing skills for all undergraduate students. 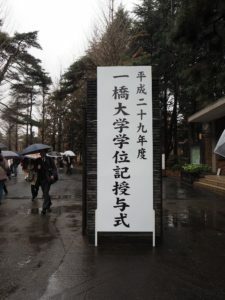 Please click here for the details and feel free to visit the Self-Access Center (Higashi-honkan 224) and make a reservation anytime you like. 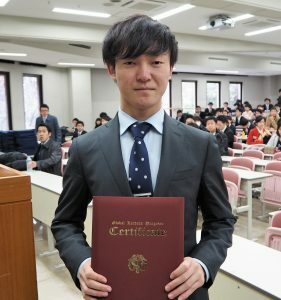 The Faculty of Commerce and Management awarded certificates to the students who successfully fulfilled the requirements of the Shibusawa Scholar Program (SSP) on March 21st, 2017. A special article of “Yonago Project” was issued in HQ Magazine of autumn, 2016. A special article of “Yonago project” held in Spring, 2016, was issued in HQ Magazine of autumn, 2016. The article is avaialble from here (in Japanese). We are currently seeking student teams to take part in the English presentation as part of the Global Human Resource Development Forum held at Waseda University on November 23rd, 2016. For details about the presentation or any other information, please check this link. The final presentations of Yonago Project were well received by the local experts in Yonago. Its report available only in Japanese. The list of the Shibusawa Scholars of 2016/17 is now available. The 13 Shibusawa Scholars of 2016/17 were selected to be a part of the Shibusawa Scholar Community. Their names and testimonials are available here. The update of Yonago project of 2016 is available. We have launched the Yonago Project with the generous support from Mr. Hiroshi Fukino, a graduate from Hitotsubashi University, and also from the Yonago Chamber of Commerce. 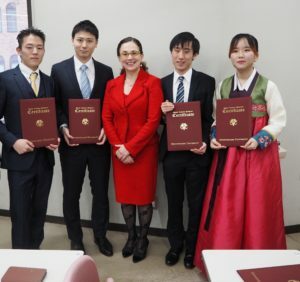 Its first report by the 7 SSP students who had a 3-day visit to the Yonago area with Prof. Ahmadjian later in March is avaialble (in Japanese). The list of SSP and other English-taught courses open to all the exchange students is now available. The Shibusawa Scholar Program (SSP) offers a wide variety of courses taught in Enligsh. Attached is a list of courses open to all the exchange students of 2016/17. Please check out this file for the description of the SSP and academic courses that we offer to all the exchange students. We are looking forward to seeing you in class! The application deadline for the Shibusawa Scholar Program of 2016/17 will be extended. The application deadline for the Shibusawa Scholar Program of 2016/17 will be extended to January 25th. For the details of the application forms, please check here (in Japanese). 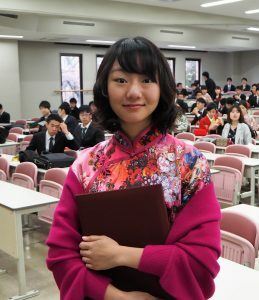 The application for the Shibusawa Scholar Program of 2016/17 will start on January 7th. We will be accepting the applications for the Shibusawa Scholar Program of 2016/17 from January 7th to January 14th. For the details of the application forms, please check here (in Japanese). The application guideline of Shibusawa Scholar Program 2016/17 is available online. 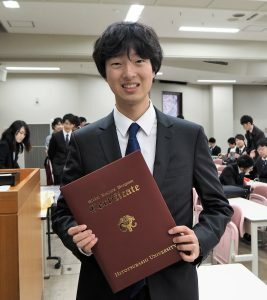 Hitotsubashi University’s team of three including a Shibusawa Scholar will deliver a presentation at the Go Global Japan Business Forum. 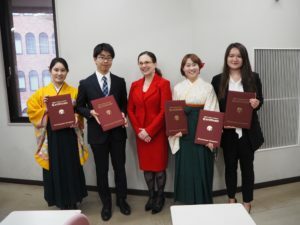 Hitotsubashi University’s team consisting of three second-year students, Akifumi FUJITA (2015 Global Leaders Class), Saisawat SAMUTPRADIT (2015 Global Leaders Class), and Yukari Jessica THAM (2015/16 Shibusawa Scholar), has been selected for the final round of the presentation competition at the Go Global Japan Regional Forum, which will be held on November 21st. For details, please check here. 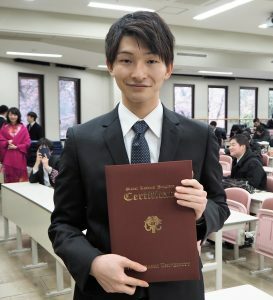 The list of the Shibusawa Scholars of 2015/16 is now avaialble. The 16 Shibusawa Scholars of 2015/16 were selected to be a part of the Shibusawa Scholar Community. Their names and testimonials are available here. An article on “Intermediate Course in Finance” by Dr. Kang was issued in HQ Magazine of spring, 2015. An article of “Intermediate Course in Finance” by Dr. Kang was issued in HQ Magazine of spring, 2015, as a example of what courses were offered at the Fauclty of Commerce and Management. This article, along with interviews with two Shibusawa Scholar students of 2014/15, captures the image of interactive learning environment in the classroom. The article is available from here (in Japanese). 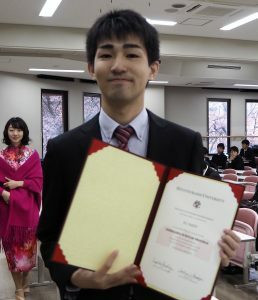 Interviews with four Shibusawa Scholars of 2014/15 are now avaialble on Hitotsubashi Channel. 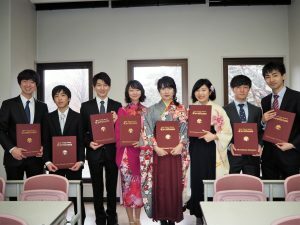 Short Interviews with four Shibusawa Scholars of 2014/15 about their missions and career goals are available here on Hitotsubashi Channel. 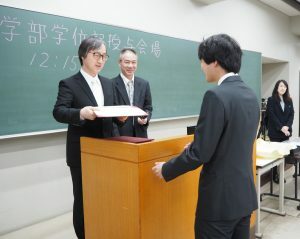 CPA Josuikai members support the Shibusawa Scholar Program to offer “Interactive Course on Business Basics (Accounting)” in the winter session of 2014/15. Students are very much appreciative of this interactive course taught by members of the internationally experienced CPAs. CPA Josuikai has also offered generous support to textbook purchases for this course. SSP open class and guidance session will be held by SSP students. The SSP open class and guidance session will be held by SSP students of 2014/15. This open class includes three mini lectures by professors who teach SSP-related courses and a Q&A session with SSP students. For details, please check here in Japanese. The fourth briefing session of SSP will be held on December 15th. The application guideline is available on the “Selection” page. For more infomation, please check the ”application guideline” (in Japanese) on the “Selection” page. The sixth OneBridge Seminar will be held on December 8th. The sixth OneBridge Seminar will be held on December 8th. The guest speakers are consutants from Heidrick and Struggles. The talk and discussion look at how to develop global leadership skills. The talk will be in English. For datails, please check this flyer (in Japanese). The fifth OneBridge Seminar will be held on November 24th. The fifth OneBridge Seminar will be held on November 24th. The guest speaker is Dr. Michele Ruiter, an Africa Research and Strategy Specialist at the Development Bank of Southern Africa. The talk looks at the varied experiences across the fifty-four African countries and provides an overview of opportunities and pitfalls that you might come across in your engagements with the continent. The talk will be in English. For datails, please check this flyer (in Japanese). The fourth OneBridge Seminar will be held on October 27th. The fourth OneBridge Seminar will be held on October 27th. The guest speaker is Prof. Reiko Goto from the Institute of Economic Research, Hitotsubashi University. She will introduce theories on justice of Rawls and Sen, and examine how a focus on injustice can help us better formulate an alternative theory of justice. The talk will be in Japanese. For datails, please check this flyer (in Japanese). The third briefing session of SSP will be held on October 29th. Please sign up your team and present your idea in English at the Global Human Resource Development Forum. The third OneBridge Seminar will be held on July 21st. The third OneBridge Seminar will be held on July 21st. 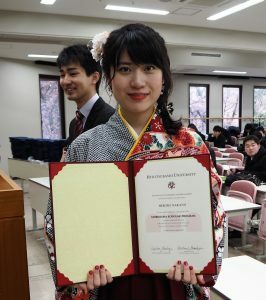 The guest speaker is Ms. Mio Yamamoto, a Representative Director of World in Tohoku (WIT). She will talk about the growing importance of leadership that will bring social change. For datails, please check this flyer (in Japanese). The second OneBridge Seminar will be held on July 14th. The second OneBridge Seminar will be held on July 14th. The guest speakers are Prof. Takeo Kikkawa and Prof. Kazuhiro Tanaka, who are both experts in the Japanese business history. For datails, please check this flyer. The second briefing session of SSP will be held on July 8th. The first OneBridge Seminar of 2014/15 will be held on June 16th. The first OneBridge Seminar of 2014/15 is to be held on June 16th. 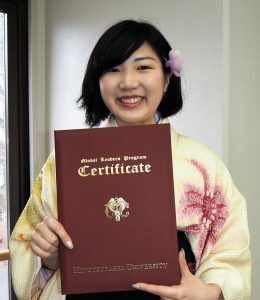 The guest speaker is Dr. Yoko Ishikura, a Professor Emritus of Hitotsubashi University. For details, please check this flyer. The first briefing session of SSP will be held on April 16th. 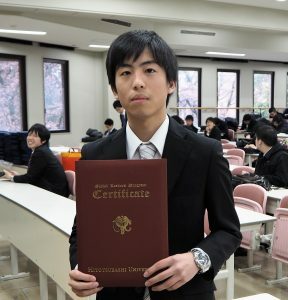 The “Shibusawa Scholar Program” students of 2014/15 were selected. 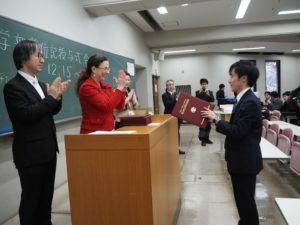 Thirteen students were selected as the first “Shibusawa Scholar Program” students. We will hold an orientation and guidance session for them on April 4th. The application guideline and related documents are available on line. For more information, please check the “Selection” page (in Japanese). The fourth OneBridge Seminar will be held on December 16th. The fourth OneBridge Seminar is to be held on December 16th. The guest speaker is Mr. Ken Shibusawa, President and CEO, Japan Center for International Exchange and Chairman, Common Assets Management. For details, please check this flyer. The application guideline is uploaded on the “Selection” page. The second briefing session on SSP will be held on November 27th. The third One Bridge Seminar will be held on November 18th. The Third One Bridge Seminar is to be held on November 18th by having Dr. David Vogel from UC Berkeley as a guest speaker. For details, please check this flyer. The Second One Bridge Seminar will be held on October 30th. The Second One Bridge Seminar is to be held on October 30th by having Mr. Daichi Konuma as a guest speaker. For details, please check this flyer. GLP courses, instructed in English, will be offered in the winter session, 2013. GLP courses, instructed in English, will be offered in the winter session, 2013. For details of the courses offered, please check out Mercas, the online course syllabus. The first briefing session on SSP will be held on July 17. For details, please see this. Information on Core Curriculum updated. 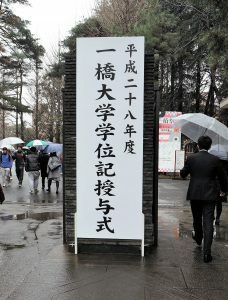 The website of Shibusawa Scholar Program opened.